Showing results for tags 'tragedy'. Info | Sign ups The Universal Star Story-Love and Hate, Hope and Despair. (Role-Play Interest Check, Sign-Ups and/or Discussions included.). Tagline: " ... Love and Hate ... Hope and Despair ... Two sets of very different yet similar ideals ... Which of the two sets ... Shall triumph? ... In the end? " Synopsis: " ...In the world known, as "Planet IV: Brown Star"...the universe...the entire galaxy itself, is at war...the world is divided up into five sections of the whole universe, these sections besides Planet IV are known, as "Planet I: Red Star", "Planet II: Blue Star", "Planet III: Green Star" and "Planet V: Yellow Star"...altogether, these five sections of the galaxy are known to be called, as "Star Cosmos", Star Cosmos being the real name for the universe itself. As for the reason why the five sections of the whole galaxy are at war with one another, it is because each other is fighting over a valuable resource material that has been indispensable since both the formation and the dawning of the creation of the Star Cosmos called "Star Cubes", Star Cubes are said to contain the natural birth energy both of and from when the universe was first created, right at its very beginning in the forms of elemental particles that both make up and disperse among all of the people living in the Star Cosmos in turn in the forms of Earth, Fire, Water, Wind and Lightning energies. People born from the elemental energy that is formed when the five elements all combine into one are called "Elementilims" and it is said that the life forces of Elementilims or "Elementi" for short can be increased over a period of 100 years each with the consumption of each and every single new Star Cube that they find and consume, extending their life force past the normal expiration date, keeping them ageless and both fit and healthy without a care in the world, all in all, to put it in simple terms, Elementi live exactly like Cockroaches, very stubborn to kill... However, it is because of the Star Cubes' ability to produce ever lasting long life in the form of what appears to be "immortality" that other planets had begun fighting over the Star Cubes for their very own ideals, one planet believes that they must obtain all Star Cubes before the other planets do so that both they and they alone can go on living, as the both supreme and almighty beings that reign supreme over the entire galaxy itself whilst another planet holds a religious aspect on the power of the Star Cubes and how they should be used, going, as far, as to try to obtain them from failing into the wrong hands and believing that death must come to all natural things, even the Elementi themselves... Although the Elementi are all made up of the same cosmic elemental energy, they are all each divided into one category such, as the element of Earth for example when one particular element inside their bodies grows stronger above all the rest and goes so far, as to reshape the appearances of their physical attributes, even molding their natural personalities, for example, the people with having the Earth element inside of them proving to be a winner of a contest of inner body elements for example are shown to have rock shaped, dragon like scales on their bodies with other Elementi races differing in other appearances also should an element besides Earth win the contest of the five inner body elements of Earth, Fire, Water, Wind and Lightning, for examples, the Elementi races of both Fire and Water are always seen with ever changing fluid forms, meaning in other-words, their bodies are always constantly on both Fire and Water respectively but that they have the powers to reshape their entire bodies, as close to "Human", as they can get them...the sub categories of the Elementi people are referred to, as "Earthmenti", "Firementi", "Watermenti", "Windmenti" and "Lightningmenti.". All Elementi are gifted with both magical prowess and a knack for scientific achievement in the advancement of technology that would help to better their respective races, some have even gone so far, as to refer to Elementi by the term of "Alchemists" or rather in the tongue of the Star Cosmos' people "Elementists", Elementists are said to combine their natural elemental energy all together into one from within their entire bodies and then merge it with an inanimate object like both a sword or a necklace pendent for examples that they call "Vassals", as from the objects that they are born from infused with elemental energy appear beings that act, as spiritual familiars in physical forms to their respective both creators and owners, always protecting them from both far away and close by, in the term of the latter, the Vassals lend their powers to their Elementi counterparts by summoning themselves forth, as uniquely shaped weapons, appearing in whatever both shape and/or form that represents the inner heart of their original Elementi creator and owner, however...this dwindles away the life force of the Elementi host, thus requiring the power of the Star Cubes in order to live on, even if they do not wish to seek "immortality", "immortality" is the only means for the Elementi to "survive", the only means...hence the war between the Elementi on all of the five sector planets residing within the Star Cosmos that has come to be called the "Cube Wars" over the last 550 years, how long the Cube Wars have been going on and are still currently ongoing...with no end in sight... On Planet IV: Brown Star, in the capital ocean city known, as "Elelantis-The Seafaring Kingdom of the Earth" rule the imperial monarchy called the "Royal Dynasty of the Chang Tzu Clan", otherwise known, as the "Chang Tzu Empire", headed by their elderly ever aging king named "Shong Chang Tzu the 25th", Shong is a man who believes in strong Social Darwinism and survival of the fittest and believes that only those worthy of becoming Elementists that can serve in the empire's ranks and fight against the armies of the other planets have what it takes to absorb Star Cubes and continue going on living, this rule applies to the woman, children and elderly of all of Planet IV, as well, not allowing even a iota of a singular "inferior specimen" to exist on his planet... Outraged by the king's decision to only let the strong survive and the weak die, no matter what their current circumstances and backgrounds are, a young man of 18 years of age rises up from the underground slums of Elelantis and prepares to prove himself a Elementist, intending to work his way into the army of the empire and change the ways imposed by Shong's decree of natural law and order, making not just a chosen few's lives better but also everyone else's in the process, this young man's name is "Kyibolt Vazahard", otherwise known by those close to him by both his nickname and title, "Kyi the Elelantian Troublemaker", Kyi is unique among all the people that are aiming to become Elementists for normally a person wishing to become a Elementist can only become so once their elemental powers have reached maturity more or less at the age of 20, Kyi has become an Elementist since he was 16 years old, it happened in a freak accident of nature itself and ever since then, Kyi has had the power to call upon his Vassal familiar in the both form and shape of a very attractive female genie like being that calls herself "Djinna", Djinna's appearance is based on the inner workings of Kyi's own heart, of which believes in both love and hope and defies both hate and despair, Kyi has been raised, as an orphan on the slum streets of Elelantis and has been cared for by the local shop owners working in the slums just trying to get by and earn their day to day daily pay from the empire paying for the merchandise however meager and small the pay very well is, having seen firsthand the corrupt empire, as it is from a very early age, Kyi now works with Djinna to secretly enlist himself, as a 20 year old male with a made-up background thanks to a close friend of Kyi's in order to enter the Chang Tzu Empire's army and once inside, Kyi intends to wreak all kinds of havoc regarding issues of both morality and philosophy, his planned attempt to make the empire change their ways, however, his plan may not go according to plan, as he first thought...as the empire is planning to send their army into battle against one of the other respective planets, leading the empire's 15th battalion into battle is king Shong's 3rd daughter, the 21 year old young woman named "Xixi Chang Tzu" and thus, the curtain rises on a whole new battle, what will become of Kyi and where will the path of destiny take him? find out, in the ultimate battle of both love and hope vs both hate and despair...the wheels of destiny are beginning to spin and at last Samsara will be achieved. Our story starts in the year 8018 of the Star Cosmos universal calendar, the Earthmenti have just suffered a "shocking" defeat at the hands of the Lightningmenti forces and are now regrouping during a very short ceasefire in order to gather up more fighters for the next upcoming battles with not just the Lightningmenti but also the other races of the Elementi, as well, the story starts in Elelantis, here, is where everything...begins: The Universal Star Story. " Here is the Role-Play's Theme Song (MAJOR SPOILERS WARNING): https://youtu.be/4iHgARWX7dA. Elementi Character Sheets: Name: Age: History: Personality: Appearance: Race: (Earthmenti, Firementi, Watermenti, Windmenti, Lightningmenti.). Vassal partner: Voice Actor: Theme Song: Vassal Character Sheets: Name: History: Personality: Human Appearance: Weapon Appearance: Elementi partner: Born from what aspect of the Elementi's heart: (Beauty, power or something else.). Voice Actor: Theme Song: Rules: No Swearing above Age 15. No Romance above Age 12. Voice Actor and Theme Song doesn't need to be filled out, they are there just for fun. No Godmodding. To show that you have read the Rules, please put down "A New Beginning" at the end of your Character Sheets. The five different races of Elementi each have different Personalities and Appearances, the Earthmenti appear like crystal like Humanoids with rock shards appearing all over parts of their entire bodies whilst the rest of the Elementi have fluid shape changing forms, they can use their respective elemental makeup to take on whatever forms that they desire, however, once they take on the form that their heart desires they are permanently stuck in that form and cannot change their appearance whatsoever, they can transform into like a bolt of lightning for example for those that wish to have Characters based upon lightning Elementi but that is about it, they cannot change their overall physical appearance that they have chosen to go along with, the reason for this will be explained during the story, as for transforming into the elements themselves, to show which race of Elementi that they belong to, their respective element will appear, as an appearance trait on parts of their bodies, like Lightningmenti for example having lightning bolt shaped eyebrows or both Firementi and Watermenti for examples having hair constantly flowing and set on both fire and water all the time respectively, know what i mean? sorry if i'm not making any sense :[, please PM me if you want better explanations of the different Elementi, as for the Windmenti whose Appearance wasn't mentioned, they are the most Human like in physical forms, unlike the rest of the Elementi they appear, as though they were normal Human beings, the Lightningmenti finally again for example occasionally have sets of drums attached to the back of their bodies which, as the reason for that will be explained later on within the story, they are based on the physical appearance of the Japanese deity of thunder Raijin. Earthmenti are known to have stubborn personalities, Firementi with "fiery and hot headed" personalities, Watermenti with calm and almost completely tranquil personalities, Windmenti with almost zealot and religious like personalities and Lightningmenti with bad tempered and battle craving personalities. You can have, as many Characters, as you can manage though i personally recommend having four each per person, two normal Elementi Characters and two Vassal Characters, you must have both a Elementi and a Vassal, as a pair, there are no exceptions since Elementi and Vassals fight alongside one another and the latter can even transform into weapons for the former to fight with if they want an up close and personal fight. The Role-Play's basis for two Characters serving, as each other's partners, whether in battle or not is from a combination of both Xenoblade Chronicles 2 and Soul Eater just in case anyone is wondering :], the partners must always be close by each other's sides for if not then each half of the set of partners' battle strengths will be dwindled by half exactly, you can form partners with other Role-Players' Characters, as well instead of just your own if you like but you must inform me in a PM who wants to pair up with who upon when the story begins, as for the story's beginning, everyone's Characters will start off in Elelantis and from there, everyone can set off and create whole new locations of their own that they wish to have their Characters appear in and write plot-lines about, however, you must first PM me about what backstories for new locations you have in mind and only once you have consulted with the other Role-Players about what you have in mind. Vassals do not Age and are instead born from the heart of the Elementi that originally created them, they are based both on and around that Elementi's true inner characteristics and workings and serve both to balance and counterbalance their Elementi equals, basically they are the true self of the Elementi they belong to physically personified in whatever form and/or shape they appear in, for example, if a Elementi had a very childish personality deep inside of them then their Vassal would appear in the form of a child to represent their respective Elementi's true inner persona but if a Elementi for example felt the desire deep inside their heart to have a close friend and/or loving partner, the latter in terms of romance then their Vassal's appearance would be based on that heart's respective desire and grant whatever wish of physical form that the respective Elementi want their respective Vassal to have, know what i mean? sorry again if i'm not explaining things clearly, a Vassal is born from whatever lurks inside a person's heart, they take on physical forms that either represent beauty, power and etc, namely they are born from the attribute that strongly relates to and personifies their Elementi's overall strongest characteristics. Have fun above all else, i hope everyone will Sign-Up for and enjoy this Role-Play :]. Inspired by both the title and the premise of the video game Lost Odyssey, although the story is called "Lost Spirited Odyssey", it is not related to the former title bearing the name Lost Odyssey, instead, it is its own story but does bear similar aspects to the video game title which you will see in this story. " ...8 Worlds...8 Individuals...all shattered... This is the story of 8 people who have different but a shared connected destiny with one another, soon...very soon...their individual paths will cross over with each other's and their destinies intertwined, as one... The World of "Ayoka", a land where all both superstition and fantasy bare both shape and form in one way or another, here...the world is divided up into two continents: Both the "Taiken" Federation and the Republic of "Ishama", the latter prefers to follow the ways of both peace and harmony, however...the former, fearing that this is simply just a ruse to plot invasion against their own country decided to strike first and attack the Republic, thus erupting into all out war that has become known throughout the ages, as "The Creation War"...the war that has taken place since both the Federation and the Republic's formations of their respective homelands. The capital city of the Republic named "Eikolo", despite having an army of its own, since the very beginning of the Creation War...up until now, its forces have started to drain thin, not being battle prepped and ready, since the army of the Republic is mostly made up of common folk, volunteers and farmers from the countryside of the land, how they have managed to keep an 80 year long war against their enemy, the Federation, made up of battle hardened, strong warriors that have been keeping their skills honed day after day, night after night, never faltering, never waving...is a mystery, however, the Republic still refuses to submit to their foe and will keep up their almost religious belief that peace must be maintained, no matter what, even if it is won through war and so...seeing the dedication that these people have shown in the last 80 years since the Creation War had first started, an elderly aged man from the Federation defects from his side, a strategist...his name is "Ramos"... Ramos pleads directly to the "Council of Eight", the rulers of both Eikolo and the overall Republic, begging that they grant him both sanctuary and immunity, as he in return says that he will provide a plan that will help the Republic win the war against the Federation...the Council's members are skeptical but their young leader at the age of 14 named "Keido", son of the previous leader of the Council who died earlier on had passed on his leadership role of succession to his young teenage son just a year earlier, wanting the war to end...without hesitation both accepted Ramos into the Republic and had wished to hear what his plan was of both defeating the Federation and bringing a both swift and quick end to the Creation War, despite being against the Council's wishes, furthermore...Keido even made Ramos the 9th new member of the Council of Eight, believing that he would become vital to the Republic's next move on how to end this war against the Federation, the sooner...the better... Four years have passed since then and the Council of Eight have now become the Council of Nine, Keido is now 18 years old and with the ever aging Ramos now by his side, Keido has become a stern tactician, using whatever means necessary to get the job done in order to save the Republic from downfall at the hands of the enemy, Ramos meanwhile has earned the full scorn of the other Council members, as he is valued both greatly and highly by Keido for making the Republic the battle prepared army that it is today, even though the Republic are winning more battles then they have ever done so in the past beforehand, they feel like that the Republic has become corrupted through Ramos' military influence, believing that this was secretly his goal all along and that he was sent by the Federation, disguised, as a seemingly frail old man to infiltrate the Council of Eight and corrupt Keido who was young at the time's views on how the Republic should be run, although the Republic's desire for peace remains the same, they have become far too militant in the last few years and are even taking their militaristic views out on the Republic's people, forcing taxes to wage more funding for the war profit and even drafting young folk through force to join the army, even using blackmail behind Keido's back without him knowing in order to do all these horrible things, the Council would have normally spoken up in the past but unfortunately, Keido has made Ramos his most trusted adviser among the Council of Nine's members and even looks up to him like a both mentor and father figure, Ramos is now technically the 2nd in command over all of the Republic itself and again believing that the Federation had sent him to fulfill this mission, to put it in simple terms, basically: the Federation now has both full and total access to both the Republic and all of its resources...to put the icing on the cake, as it were...there are even talks of the Federation now going to communicate peace talks with the Republic despite having both started the war and putting it up for so very long in the first place, if Keido blindly accepts this near obvious farce of a peace treaty, the Republic will have no hope whatsoever and will forcibly become apart of the Federation, accepting their dictatorial views both on and of reality itself, truly...will both peace and harmony die out and the Creation War...will come to an end...thus, the Council have augmented their very own strategy against this... In a both very shocking and very sudden turn of events, the rest of the Council members have declared a Rebellion against the Republic that they call "The Resistance for the Republic", its name is meant to imply that it is for the Republic, by the Republic and with the Republic but it will not allow the Republic to fall into the Federation's hands and thus, despite Keido's wishes, the Council of Nine have officially disbanded and are trying to overthrow both Keido and especially Ramos in order to return the Republic back into its very own hands, even if it means inciting Rebellion in order to do so...the former Council leaders are now headed by a man by the name of "Gwyle", the former Council's 3rd in command and of whom, unlike Ramos, truly wishes for both peace and harmony for the Republic, knowing that he cannot change young Keido's mind so long, as he is under Ramos' influence, to save the Republic of Ishama from the Taiken Federation, to save what they believe to be all of Ayoka itself, Gwyle has banded together all of the Republic citizens that know something is wrong with its inner workings and oppose the leadership of Keido, secretly being manipulated by Ramos from behind the scenes, to save the Republic, Gwyle believes that the Resistance for the Republic must first strike one of the Republic's most vital weak points in order to get their message across, their message is to attack "The Kyula-Kyula Water Dam" that gives the capital city of Eikolo all of its water supplies and electricity, by taking the Dam out, the Resistance will be able to deal a heavy blow to the Republic's army, depleting them of their energy both based and enhanced weapons, stopping them from stopping the Resistance to mount a full scale invasion upon Eikolo and take Ramos hostage, to force him back into the Federation and keep their militaristic hands off the Republic that still wants to pursue both peace and harmony, the Dam is located right at the very end of Eikolo's borders and so Gwyle, wanting to strike both swift and smoothly, sends in a team of young recruits, ready for battle, to perform a sneak attack operation on the Dam before the rest of the Resistance can then both fully move in and charge the Dam themselves, in order to both take control of it and hopefully make peaceful negotiations with Keido straight afterwards, this team consists of a young woman and two men, the rest of the Resistance will act, as a diversion, taking the Republic's eyes off from the Dam and straight towards them, to give the young recruits a fighting chance at the Dam, thus a full scale battle begins at the fields near the Kyula-Kyula Water Dam called "The White Grass Fields of Emtempola", here, soldiers of the Republic and soldiers of the Resistance are both dressed in the very same armour with the very same colours though having opposite reflections, the Republic wear both black and white whilst the Resistance wear both white and black, it is here that one of the aforementioned eight, the eight people that would share a connected destiny appears, a young man, age 17, he is already the rank of general of the Republic forces, his name...is "Vahnhart "Vahn" Ligerheart.". This is where the story, truly begins. Prologue: Fate of the World-Concluded. (What does everyone think about the Prologue :]?). Prior knowledge about KHX is not needed to understand KHUX! Thanks to the newest KHUX Quests, we now know that you do not need to have prior knowledge about KHX in order to understand KHUX, because they are starting to put flashbacks of KHX in the game, and some of them are even playable. 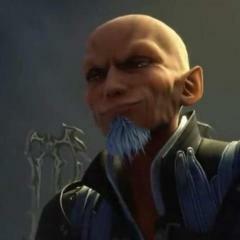 For those who don't know, KHUX is actually technically a sequel to KHX. At the end of KHX, the Player got brought to the Unchained realm and has to relive their entire journey of KHX once again, except without the moments of tragedy (the Keyblade War). This happens to all of the Dandelions. The entirety of KHUX has been the Player reliving their journey from KHX, which means it's a sequel. Since this is the case, I, along with many other people, were worried that this would mean that you would have to have prior knowledge about KHX in order to understand KHUX, which would be completely unreasonable for the average KH fan who's already struggling to understand the lore. But, since they are putting flashbacks to what happened before, KHX is no longer needed! It would probably help to have prior knowledge about KHX since I doubt the flashbacks will show absolutely everything that happened, but for the most part, all you have to do in order to understand the X story is to play KHUX and watch X Back Cover!